Pinarus Inventius is an Imperial hunter living in Anvil with his wife Astia. He offers advanced training in marksman. He is reputed to be the most experienced huntsman in town, and you will need his expertise to track down and kill four mountain lions during the A Rat Problem quest. At some point he was unfaithful to his wife and became a victim of the clever Siren's gang. Presumably out of embarrassment and the fact it would damage his reputation, he never reported the robbery to the Anvil city watch. 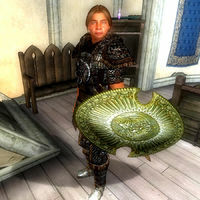 Pinarus is equipped with a leveled set of heavy armor consisting of the cuirass, greaves, gauntlets, shield and boots. He is armed with a leveled longsword and carries a spare light armored shield with him. He also has a set of lower class clothing consisting of a shirt with suspenders, breeches and a pair of rough leather shoes. He also carries his house key. Even though he lives in the busy harbor town of Anvil, he is still a woodsman by heart and divides his time between Astia and hunting in the wilderness. He wakes up at 6am and spends the morning relaxing on the second floor of his house and chatting with his wife. At midday, he eats a two hour lunch before he heads off for his daily hunting trip. He will go out to the crossroads outside the city gate, and stand there looking for potential prey for three hours. He leaves the spot at 5pm, heads home and arrives at his house just in time for his 6pm dinner. Once full, he leaves the table at 8pm and spends the rest of the evening on the second floor until his bedtime at midnight. He will offer training at all times, except when eating or sleeping. During the related quest, he will break off his routine in order to lend you a hand in tracking down the mountain lions that have been terrorizing Arvena Thelas' pet rats. He will take you to a small grassy area surrounded by rocks, just northwest of the Horse Whisperer Stables. Once there, he will fight the lions alongside you, and afterwards, he will stay alert in the area, until you complete the quest. During this stage, he will not offer any training. His huntsman skills haven't gone unnoticed among the townsfolk of Anvil. When asked about rumors, they will tell you that "Pinarus Inventius is quite the hunter. He can track down anything, and he's deadly with his bow." and "I saw that Pinarus Inventius was out hunting again. He can shoot a bird on the wing without really trying." Others will simply comment: "Pinarus is an impressive tracker. I'd like to see if he can teach me a bit about using a bow." and "You could learn a lot from Pinarus." When you meet him for the first time, he will introduce himself and his passions in life: "Pinarus Inventius, hunter, woodsman, and marksman, at your service." And when asked about Anvil he will go into details: "Plenty of deer, wolf, boar, mountain lion, bear in the county. Just need to know where to look for 'em." During the Fighters Guild quest, he will be quite surprised when you give him the facts: "Mountain lions? Here? Odd. If they're around, I can find them. Come with me. A hunt will do us good, and maybe make that old nut feel better." When you and him arrive at the spot, he will fill you in on the situation: "If they're out here, they'll be in this area. I can't imagine there are more than four of them. Let's take care of this." After the fight, he will ask you to seek out Arvena once again: "I think that'll be all of them. Can't imagine more in this area. You can go tell Arvena this is all taken care of. Good hunting." Once you have read Modern Heretics or spoken with Ulene Hlervu about "Cheydinhal", a new "Daedra shrines" conversation topic will appear. When you speak to Pinarus about this, he will mark Malacath's Shrine on your map with the words: "I saw a big statue of Malacath, west of Fort Sutch, west of the Gold Road to Hammerfell. Looked like Daedra worshippers to me." As an advanced trainer, Pinarus can provide you with the necessary reference for the Marksman Master Training quest. Once your marksman skill level reaches 70, speak to him, and choose the "training" option. If he responds with "You are very good with a bow. It's a shame I can't help you any more. If we were better friends, I might be able to give you one last piece of advice." then you will have to play the persuasion mini-game or bribe him to raise his disposition to 80 or more. After that, he will be more talkative and trigger the quest pointing you towards master trainer Alawen with the words: "There’s only one last thing I can say about Marksman training. If you want to be the best, you have to learn from the best. And the best I've ever seen is an Archer named Alawen. Not sure where she is now; last I heard, she had a camp east of Anvil, out in the forest." You can find items that were stolen from him at the Siren's hideout, Gweden Farm. He won't take them back, though. During A Rat Problem, it is possible to run ahead of Pinarus and kill the mountain lions yourself. Doing so will cause Pinarus to wait for you indefinitely where you left him, without offering training, even after the quest is completed. This can be solved by following Pinarus to the spot where the lions used to be. Once there, Pinarus will resume his usual schedule and offer training once again. Esta página foi modificada pela última vez à(s) 06h53min de 11 de março de 2014.